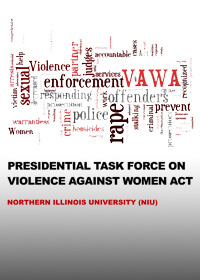 Northern Illinois University today released the report of the Presidential Task Force on Violence Against Women Act, which contains policy and procedural recommendations that enhance NIU’s efforts in the prevention of sexual assault, provide support for sexual assault victims and survivors and strengthen policies and processes related to student conduct and reporting. The task force was formed by NIU President Doug Baker as a proactive measure to recommit to creating safe, supportive living-learning communities by protecting all students from sexual assaults. Key recommendations contained in the report include improved collaboration with community partners and expanded communications and programming regarding sexual assault, prevention and survivor resources and services. Task force representatives included NIU students, faculty, staff and administrators in addition to public safety officials, community members and others. Provide optional training for instructors to reduce victimization including student self-care, referrals and more. The task force recommended conducting regular campus climate surveys to assess the prevalence and incidence of sexual assault on the NIU campus as well as gauge student attitudes toward and perceptions of campus climate with regard to sexual assault issues. The task force also recommended strengthening community partnerships and streamlining services and referrals to on- and off-campus partners, including memorandums of understanding with partner organizations. “This task force was a collaborative effort, not just on campus, but also with community partners, including representatives from the DeKalb Police Department and Safe Passage. The next phase is to look at the recommendations strategically and follow through on them,” said Vice President for Student Affairs & Enrollment Management Eric Weldy, who co-chaired the task force with Rigg. The creative, insightful and pragmatic recommendations contained within the report, when enacted, may position NIU among the nation’s leaders using federal and community resources and tools to address the national problem of campus sexual assaults.